Bring a parts book to study. How long are you letting the Cub run before declaring no oil pressure? The reservoir needs to fill first before any pressure will read on the gauge. Give it 20-30 seconds run time to fill the reservoir and build up pressure that will show on the gauge. Wrose2 wrote: it was pushing oil out of the top of the filter bolt before we replaced the brass ring and tightened the bolt more. We had it running probably more then we should have trying to fix the idling issue (got it idling nice now). But it definitely had more then enough time to get some kind of pressure reading on that gauge . 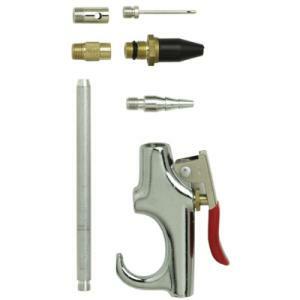 If you have a blow gun for your air compressor, you can remove the tip and screw the pressure gauge in its place. Set your air compressor regulator for 30PSI, and give it a shot of air. If it is not the relief valve, then it is time to pull the motor. Take a good look at the number 1 rod bearing for sure, because that is at the very end of the oil gallery. Cubs don't need much oil pressure at idle, so maybe you will be OK if it is that plug. OK I was able to replace that pressure valve and spring. Now I have pressure reading on the gauge! When the Tractor is just idling it doesn't have much pressure . the needle is just barely out of the red area on the gauge. When I increase the throttle the pressure does come up pretty good. Should I have more pressure at idle? Good news. Low idle oil pressure is indicative of too much bearing clearance, however, you don't need very much at idle. Hard to know what you have exactly with a guesstimator gauge. It is normal for pressure to drop at idle and as long as you have pressure up in the working zone you should be OK. Keep a close eye on it to see if it drops significantly when it is being worked- like mowing. It is easy to measure with plastigauge. It is a thread of plastic that you lay across the bearing and then assemble and tighten the caps. The thread crushes and you compare the width of the squashed thread to a gauge to get the clearance. You can do it just by dropping the pan. How much clearance should I have ? Wrose2 wrote: How much clearance should I have ?